Damen Shipyards Group will contribute to the development of LNG bunkering options within the North-East Baltic Sea, care of a forthcoming gas bunker vessel. Damen will build the 100m ship at its Yichang Shipyard in China – a task it expects to complete by September 2020. The vessel will then be handed over to Estonian electricity and gas company Eesti Gaas, which will use the bunker vessel to conduct ship-to-ship LNG transfers under a long-term charter from parent company (and owner of the vessel) Infortar. The newbuild represents a brand new concept for Damen, which has dubbed it the LGC 6000 LNG class. Confirmed features include 6,000m³ of LNG capacity, stored at -163⁰C and spread between two type-C tanks, and a dual-fuel propulsion system and gas burner for the management of the boil-off gas. Citing an example of how the forthcoming bunker vessel will assist in reducing vessel turnaround times, Eesti Gaas highlights the fact that Tallink’s 212m, LNG-fuelled ro-pax ferry Megastar currently requires the use of 11 bunkering trucks for a single vessel-refuelling operation. 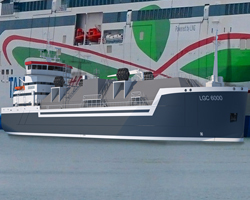 In contrast, the company says, the LGC 6000 LNG will be able to replenish the ferry’s LNG stock in a single operation, cutting time and taking a significant amount of traffic off the roads.